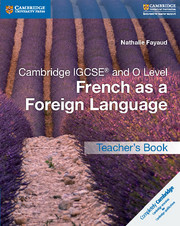 A flexible suite of resources providing full coverage of the Cambridge IGCSE® French as a Foreign Language syllabus (0520) for first examination in 2015. With a skills-based approach and an international focus, this coursebook with audio CDs and Cambridge Elevate enhanced edition promotes a deeper understanding of the French language and culture. It includes 200+ auto-marked formative assessment questions and embedded audio. Engaging texts, images and audio enhance the activities in the coursebook and help students develop language skills. 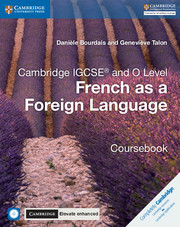 Exam-style questions and clear learning objectives encourage self-assessment and support students through the Cambridge IGCSE® French as a Foreign Language course. Cambridge Elevate enhanced editions are available online and on tablet devices through the Cambridge Elevate app. 200+ formative assessment questions provide students with extra practice in the four language skills whilst supporting teachers with evaluating student progress. Assessment questions are auto-marked. Cambridge Elevate editions are customisable and interactive, allowing students and teachers to annotate text, add audio notes and link out to external resources. Engaging activities, based on texts, images and audio help students acquire the language skills in a practical way. Unit 0. Bienvenue en Francophonie ! Units 1 & 2. Révisez bien ! Unit 4. Faites la fête ! Units 3 & 4. Révisez bien ! Unit 5. Ma ville, demain… ? Unit 6. La nature – amie, ennemie ou victime ? Units 5 & 6 Révisez bien ! Unit 7. Bonjour de Francophonie ! Unit 8. L'école, et après ? Units 7 & 8. Révisez bien ! Unit 9. Au travail ! Units 9 & 10. Révisez bien ! Unit 11. En voyage ! Units 11 & 12. Révisez bien !